I have always admired artists who are willing to challenge themselves and take themselves out of their own comfort zone. I admire them even more when it works well. Case in point, Disturbed Earth (aka Dean Richards) switching things up for Black Picnic, the first in a series of releases that will offer “all ‘one take’ live playing through two Vox Pathfinder 10-watt amps, lots of pedals and recorded with Core-Sound binaural mics.” The output is fairly surprise-free ambient, but its depth and warmth, its excursions into and back out of shadowy spaces, its calm hand, and the fact that what you hear is pretty much what came straight out Richards’ guitar make this something worth giving time over to. Long pads are coaxed out of the strings and pulled across the air. They’re ghostly, for the most part, lovely ephemeral things that rise, exhale, and fade. This is at its absolute apex in the 35-minute centerpiece of the release, “Passionate.” Richards, alone with his guitar, carves out what is, for all intents and purposes, a textbook spacemusic piece. It’s got that sense of vastness and dimension, of the slow-moving grace of stars, the hush of being adrift. Mid-track there is a nice shift from warm and lightly glittering landscapes to a colder, darker zone. Choral pads slip into the far background. As a listener, this is the kind of passage that pulls me–acceptably so–up into the moment to take it in fully. With expert ease, Richards guides it back down toward the warmer spaces, and the voyage carries on. Overall, it’s a pleasure to listen to the way each new form or phrase comes up melds with the one before it to create a new moment. There are distinct harmonies and touches of mildly harsh clashes, the latter adding a lot of texture. The opening track, “Boutique,” hovers near darkness in spots, with Richards perhaps scratching at his strings to create raspy counterpoints to the pads. “Finality” is an absolute cocoon of a piece, a sonic blanket you may never want to roll out of. This track’s voice never rises above a sleepy whisper, but the scene it describes is just as full and far-reaching as anything else on the disc. Set your meditation timer for 10 minutes and use this. 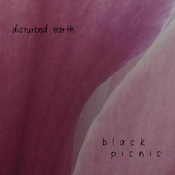 If Black Picnic is the first step in a new direction for Disturbed Earth, it is very much a step in the right direction. I’ve enjoyed it as a low-volume loop, but I also quite like it up close and intimate in headphones. Considering that it’s one guy and one guitar, there’s a whole lot of small detail to take in as you’re lulled into a quieter state of mind. I’m looking forward to what’s next, but in the meantime I will continue to enjoy Black Picnic.